There are many ‘famous’ people called Vaughan out there: Robert Vaughan was Napoleon Solo in Man from UNCLE, although I preferred The Champions as it was a better show and I could indulge my boyhood crush on Alexandra Bastedo. There’s Frankie Vaughan, the British crooner; Johnny Vaughan, the overenthusiastic TV presenter, Norman Vaughan, the British slapstick film star and, of course the much missed Stevie Ray Vaughan…the list goes on but, there is perhaps the most influential bluesman in the list of Vaughans… the unfairly lesser known Jimmie Lee Vaughan. He is the older brother of the great SRV and was born in Dallas County, Texas in 1951. After the family moved to Austin, he became more and more involved with local bands and even supported Jimi Hendrix. Shortly after that, he formed The Fabulous Thunderbirds…a vastly underrated band whose first four albums, released between 1979 and 1983, are rather special. There were further worthy albums but they, for me at least, didn’t build on those brilliant four. Jimmie left the band in 1990, and made a “duo album” called Family Style with SRV and it was released shortly after that tragic helicopter crash. 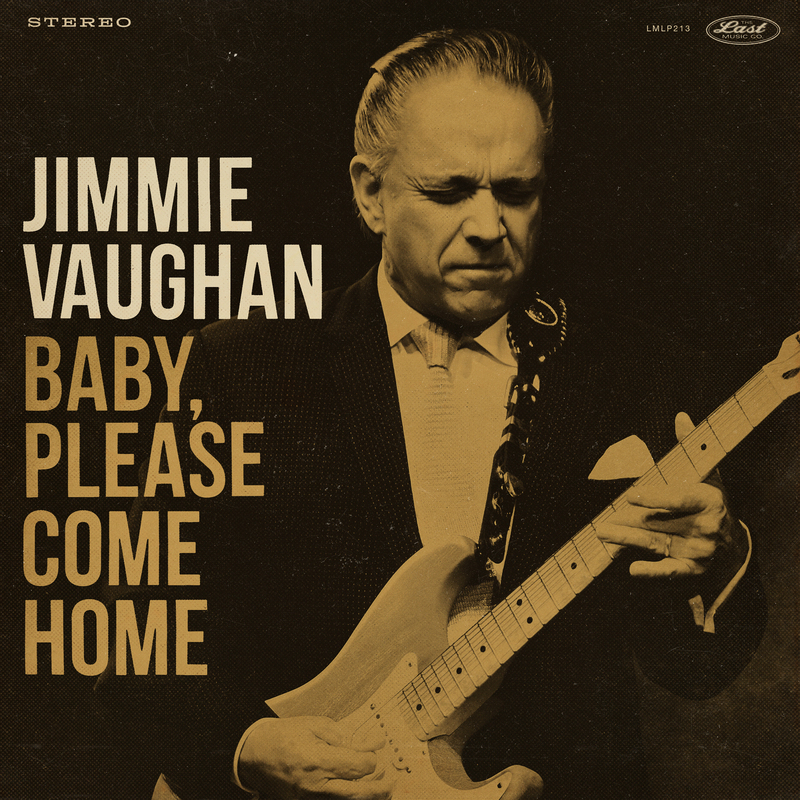 Anyway, to the present day and he has put together a great album of covers…but covers that mean something to him on a deep and personal level, so we get a healthy dose of blues from across the spectrum, interpreted in Jimmie’s own, unique way. His Stratocaster tones are a wonder to behold and, although he has tended to be in his sibling’s shadow, he is equal to SRV in his own way. Opening with the title track Baby, Please Come Home we get a brilliant update to the Lloyd Price original…JV somehow manages to sound, both vocally and guitarily (!) straight out of the 50s but with a bite that he and his band always seem to add. The guitar is spot on and could be a young Buddy Guy with the picking style and sound. A guitar and sax solo seal the quality on a lovely R’n’B infused blues. Rest easy fellow followers of the Grinch, mercifully it isn’t the saccharine Christmas (Baby Please Don’t Go) song massacred by so many…take a bow, Bono! Next up is Just A Game that takes the Jimmy Donley version and speeds it up just a little and transposes the guitar style of simple running the finger up the frets and makes it sound like a BB original…he is that talented and makes these transitions with such ease, and the whole band fit into the style and atmosphere perfectly. No One To Talk to But The Blues is a more straightforward reading of Lefty Frizell’s country classic; the bonus is another picked guitar you would swear was recorded back in the 50s. The sickly sweet titled, Be My Lovey Dovey, should not put you off…it first saw the light of day via the vocal prowess of Etta James and JV pays due homage in a brilliant reading of this bluesy song. His guitar solo is picking perfection. What’s Your Name? is a new one to me…released by Chuck Willis in a swing blues mode, JV has injected more of a R’n’B feel and more great guitar to preserve the dance hall blues of the original. Next we move to the blues of Bill Dogget who was undervalued, with a lot of his music being quite revolutionary for its time…this instrumental is a case in point with the original being a sax drenched simple riff and had a crazy organ sound…strangely captivating. JV’s version has a B3 taking the weight of the riff and his guitar is superb as it replaces the sax and embellishes the whole thing…recorded live by the sound of it, and all the more remarkable for that. It is my favourite simply because of the tones and playing prowess from JV. I’m Still In Love With You is the T-Bone Walker song done faithfully, emotionally and really well…it’s just that it is, and always was, a little insipid. It’s love Baby (24 Hours a day) is a different kettle of piscine flavours…it was written by Ted Jarrett and first released by either Lois Brooks or the Midnighters (they both came out around the same time). This sounds more like the inspiration came from the slightly later Ruth Brown version from 1955. Regardless, it is a top-notch version with simple snare giving the whole song the base on which to build; the guitar solo is another JV picked piece of class. So Glad by Fats Domino has one of the best guitar solos of the year so far…it is hesitant yet fluid and so different I could listen to it all day. Midnight Hour isn’t the Wilson Pickett soul song; this one is from Gatemouth Brown and it was always a powerful slice of blues and is actually improved here by JV’s interpretation and the way he weaves the guitar through the meaningful lyrics. Baby What’s Wrong? chugs along with the organ providing the weight while JV sings and then solos across it and I think Jimmy Reed would approve this reworking of his classic song. If you buy the vinyl, then that’s your lot….my CD however has two “bonus tracks”. The first is the appalling titled Silly Dilly Woman that has great B3 and guitar work and again makes this more than listenable. It was another new one on me but I think the original was by Jimmy Mullins who, for some reason, recorded as Mercy Baby. Final track, Exact Change, is a brilliant B3 and guitar instrumental over a swinging backline; again we get the accurate evocation of the times but with a modern studio edge that has cleaned it all up but preserved the ‘real feel’. Summarising this isn’t as easy as it sounds…every song is the perfect evocation of its era and yet it can blur if you listen to it in one sitting. However, when they appear on shuffle they are an unmitigated delight. And as JV has always said: “music is not about what it is labelled, but rather how it makes the listener feel”. Ronnie James, Mike Flanigan, Greg Piccolo, Al Gomez, Kaz Kazonoff, T. Jarred Bonata, John Mills, and Randy Zimmerman. Guest vocalists – Georgia Bramhall and Emily Gimble.